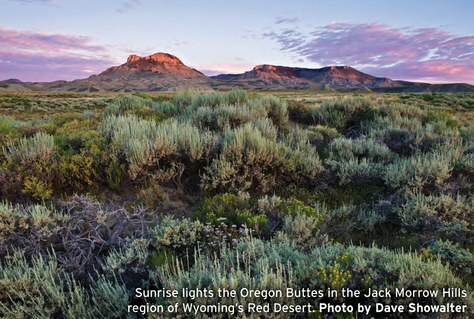 “A Walk Through the Sagebrush Sea” is an excerpt from Sage Spirit: The America West at a Crossroads by Dave Showalter and published under the Braided River imprint of Mountaineers Books. The sagebrush sea is a vast ecosystem wearing many faces across 11 states: from southern desert shrublands to mountain woodlands, from grasslands and riparian areas to the sagebrush steppe, where grasses and shrubs are co-dominant. Perhaps the sagebrush sea’s most recognizable form, the sagebrush steppe is a mix of big sagebrush, antelope bitterbrush, horsebrush, and rabbitbrush, with perennial bunchgrasses (providing horizontal cover for ground nests) dotted with balsamroot, lupine, Indian paintbrush, pasqueflower, saxifrage, and shooting stars. 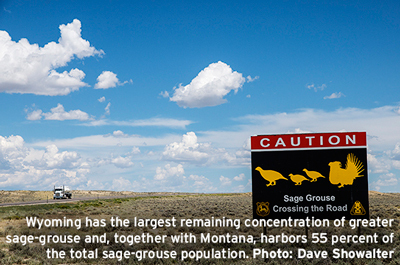 This is the realm of the greater sage grouse, Gunnison sage grouse, sagebrush sparrow, Brewer’s sparrow, and sage thrasher, obligate species that require sagebrush for cover, nest protection, and food. Undisturbed grasslands in the sagebrush ecosystem range from bunchgrasses west of the Rockies (as in Washington State’s Palouse Prairie) to shortgrass prairie east of the Rockies. You might see steppe bluegrass, needle grass, and Indian rice grass interspersed with flowering camas, dwarf goldenweed, and larkspur. The clear air rings with the western meadowlark’s melodic rising tones that instill hope. A visit to the sagebrush sea’s desert shrubland reveals big sagebrush interspersed with black greasewood, spiny hop-sage, and saltbush. Keep an eye out for tiny ball cacti, hedgehog cactus, prickly pear, and stonecrop sparsely scattered among desert parsley, rock penstemon, and bitterroot. Raptors perch in wait for mice and voles to venture out; nighthawks swoop for bugs through the evening air with a buzzy, nasal peent. Yet the sagebrush ecosystem is also interspersed with riparian areas lush with creek dogwood, willows, rushes, sedges, and monkeyflower. The intermountain West’s “gray sea” includes the upper watersheds of the Colorado and Missouri rivers as well as watersheds in the Great Basin. Red-winged blackbirds make throaty, reedy calls from cattails; the songs of yellow and MacGillivray’s warblers, song sparrows, and Bullock’s orioles resound; the scent of water draws creatures at dawn and dusk. On the fringes of the sagebrush ocean, woodlands of aspen, cottonwood, pinyon-juniper, mountain mahogany, and serviceberry are the haunts of red-tailed and ferruginous hawks, western scrub jays, black-billed magpies, and Virginia’s warblers, as well as larger mammals on the hunt. In any of these habitats, the sagebrush ecosystem is dominated by nearly thirty species, subspecies, and hybrids of the iconic plant that gives this habitat its name. The best known is big sagebrush, which has more biomass than any other shrub species in the world, says Leila Shultz in her Pocket Guide to Sagebrush (Point Reyes Bird Observatory Conservation Science, 2012). It and its four subspecies have multiple races—hybridization that results from habitat-specific specialization. Basin big sagebrush is found in Nevada’s Basin and Range country and elsewhere. 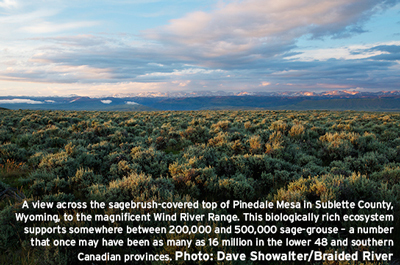 Higher-elevation mountain big sagebrush is the most palatable to wildlife—thus, extraordinarily important for animals in the Rockies, Cascades, and Sierras. Parish big sagebrush is found in California’s Mojave desert. Wyoming big sagebrush, despite its name, grows throughout the lower-elevation eastern sagebrush sea. Bonneville sagebrush, a hybrid of mountain and Wyoming big sagebrush, is also palatable to wildlife. Any of these plants has an unmistakable shape, looming tall and pale grayish-blue, with a strong scent evoking the wide-open spaces of the Old West. Each sagebrush species has a unique mix of bitter terpenoids as well as tasty compounds attractive to browsing animals. Most sagebrush species are evergreen, with two kinds of leaves: large, irregular early spring leaves drop off by midsummer—gather these aromatic sprigs for sage bundles—but the tight little evergreen bundles of perennial leaves photosynthesize during winter, providing important forage when most other woody plants are dormant. 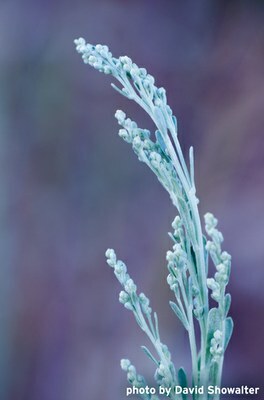 In spring, sagebrush leaves are at their most bitter and aromatic, to discourage insects and grazing animals while flowers are forming. Its many small flowers start opening in late summer through early fall, producing huge amounts of pollen; sagebrush is wind pollinated. In fall the bitter compounds that deter insects and predators break down, so the microscopic seeds become more palatable, dispersed by wind or animals that eat them. At 20 percent protein, sagebrush seeds are an important winter food source, according to Shultz. Among the many animals that forage on sagebrush are Rocky Mountain elk, mule deer, pronghorn, and pygmy rabbits. Sage grouse eat scabland sage, low (or little or dwarf) sagebrush and its two subspecies, silver sagebrush and its three subspecies, and black sagebrush, as well as the three primary subspecies of big sagebrush: Wyoming, basin, and mountain, the most palatable of all. Greater sage grouse and Gunnison sage grouse eat sagebrush foliage year-round, supplementing it with insects in summer—but in fall and winter, sagebrush is their sole food source. The sagebrush sea supports around a hundred bird species, more than eighty-five mammal species, a hundred plant species in addition to sagebrush, plus more than three hundred species of insects, fish, reptiles, and amphibians. The Pocket Guide to Sagebrush Birds, by Melissa Pitkin and Laura Quattrini (Rocky Mountain Bird Observatory and PRBO Conservation Science, 2010), lists sagebrush’s iconic species as greater sage grouse, Gunnison sage grouse, sage thrasher, sagebrush sparrow, Brewer’s sparrow, pygmy rabbit, mule deer, Rocky Mountain elk, moose, black bear, pronghorn, mountain lion, coyote, and gray wolf. 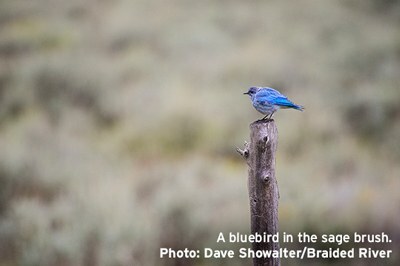 No matter which sagebrush habitat you walk through, you’ll see clear blue sky and big views, hear a unique bird chorus, and breathe in the unmistakable scent of sagebrush: the vital, life-giving shrub of the intermountain West. 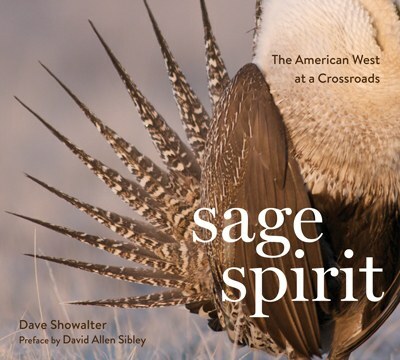 “A Walk Through the Sagebrush Sea” is an excerpt from Sage Spirit: The America West at a Crossroads by Dave Showalter and published under the Braided River imprint of Mountaineers Books. Learn more: sagespirit.org. You can meet Dave Showalter on August 12 as part of our BeWild Speaker Series. Learn more and get tickets here. This article originally appeared in our July/August 2015 issue of Mountaineer magazine. To view the original article in magazine form and read more stories from our bi-monthly publication, click here.